MoonMarble.com - Glass Eye Studio Paperweight - "Inferno"
Art Glass → Glass Paperweights & Decor → Glass Eye Studio Paperweight - "Inferno"
Planet Weights *Presented in velvet box with story card, signed and dated. Handmade in the USA - 1st Quality Only. Glass Eye Studio products contains ash from the 1980 Mt. St. Helens eruption. 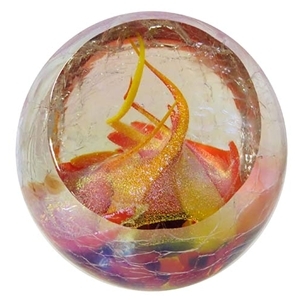 Hot dichro flames lick up inside the paperweight. The clear exterior has a crackled look to it as though from the fire. 3" dia.